Pushbutton Upshifts — No foot or throttle-hand action needed. Left thumb to button = Instant Upshift. Nextup Digital Controller — Pushbutton setup for Engine Kill and Air Valve Delay times. Input for gear position sensor lets you tune the upshift for each gear position. Works on fuel injected and carbureted motorcycles / ATV’s. CO2 Powered — Our 9oz CO2 system will deliver 1000 SHIFTS per charge! The pressure is held constant with a quality CO2 regulator. 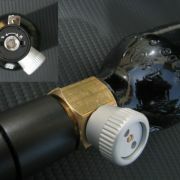 The DOT1800 bottle is black powder coated and includes a ON/OFF valve for fast change out. The bottle is refillable at most sports shops and paintball fields. Biperformance has done the work so you don't have to. Wiring diagrams, step-by-step instructions, and precision machined parts. You will save hours of labour and many missed shifts with this kit! Showing available items for a 2004-2009 Honda 1000RR. Click here to clear the bike selection. A fully tuneable upshifter for air shifters and quickshifters. Universal design will work on any motorcycle. Push button setup for easy track side tuning, no laptop needed. Wiring harness for the Nextup Terminal Controller. Affordable wiring kit can be spliced into factory or race kit wiring harness. Able to cut fuel injection or ignition making install on carbureted motorcycles possible.